Ayah Bdeir, Founder/CEO of littleBits on Reddit’s AMA (Ask me anything) #makerbusiness « Adafruit Industries – Makers, hackers, artists, designers and engineers! 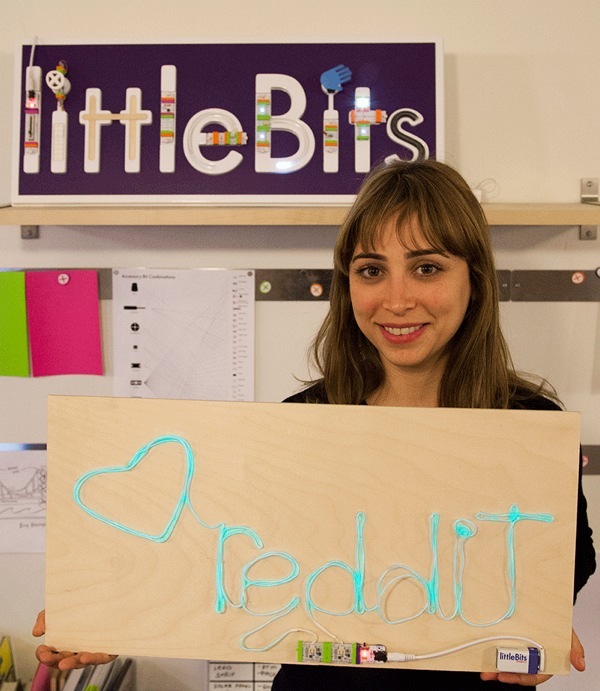 Ayah Bdeir, Founder/CEO of littleBits on Reddit’s AMA (Ask me anything). I didn’t plan to start a company, I just became obsessed with solving a problem: “how do you make electronics modular, scalable and creative?” littleBits is an open source library of modular electronics that snap together with tiny magnets for prototyping, learning, and fun. We want people to create their own prototypes, installations or just learn about electronics without any wiring, programming or soldering. Since littleBits was founded two years ago, we’ve created 40+ modules, sold product in over 60 countries, grown our Manhattan-based company to 32 people and raised over $4.5m in funding. My favorite project was the 4 foot interactive installations we created for the MoMA Design Store. And my favorite moment ever was (last week!) when I was standing in a concert at Le Poisson Rouge, listening to Reggie Watts and Nullsleep perform with a synth kit that we made with the incredible KORG! Check out the video here. For more info, see my TED talk and bio, for more info. We want to put the power of electronics in the hands of everyone, and help everyone become an inventor. Feel free to AMA!